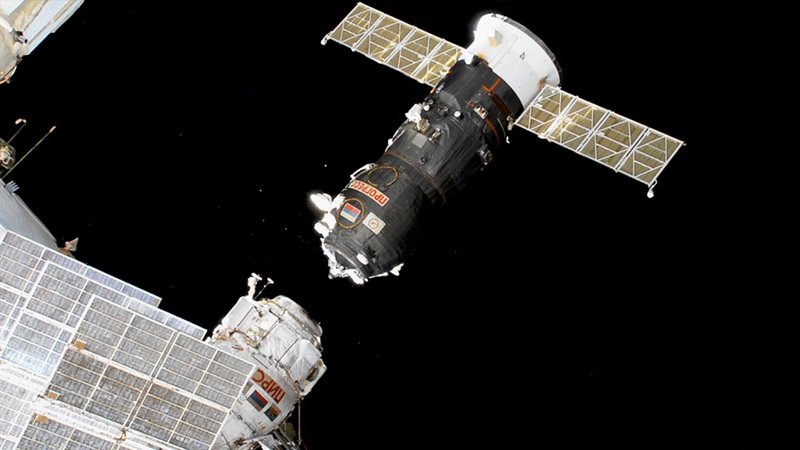 Russia’s Progress 70 cargo craft undocks on time today from the Pirs Docking Compartment . A Russian Progress 70 (70P) cargo craft undocked from the International Space Station today at 7:55 a.m. EST loaded with trash and discarded gear. It will orbit Earth a few more hours before reentering the Earth’s atmosphere over the Pacific Ocean for a fiery but safe destruction. The Progress delivered three tons of food, fuel and supplies to the station crew members on July 9. It was the first two-orbit rendezvous in International Space Station history. Today’s departure leaves three spaceships attached to the orbital lab including Northrop Grumman’s Cygnus space freighter and Russia’s Progress 71 resupply ship and Soyuz MS-11 crew ship. Cygnus is due to complete its mission when it departs from the station’s Unity module on Feb. 8. Are you saying that the Russian cargo ship has been attach on the International Space Station since July 9, 2018 and now about to in-dock? How many hatch does the space station have? If am not mistaken, the dragon space ship from SpaceX was there recently. There are eight docking ports at the station. The most spaceships attached to the station at one time was six. I’m curious. Is the area where the cargo ship will burn up close to Point Nemo? The Progress spaceship burns up over an uninhabited portion of the southern Pacific far away from civilization. Are any of the craft still attached re-usable? The only spacecraft that is reusable is the SpaceX Dragon. It’s always amazing that NASA can execute re-entry without hitting any airliners, jets, cargo ships or cruise liners with re-entries like these. How much did the reentry craft cost in design, building & launch expenses ? These organizations will have details on their mission costs and may or may not share them according to their policies. Will it’s fiery descent be visible from CA or area areas near the pacific? The deorbiting spacecraft enters Earth’s atmosphere in a remote part of the South Pacific faraway from civilization for safety purposes. Do the spaceships which are not re-usable have engines to guide them to safe destruction paths agter detaching themselves from the ISS? Yes. The spacecraft are programmed for a safe reentry into Earth’s atmosphere. What effect does a craft that burns up in the atmosphere have on global warming? Have there been any studys done? I think the burning metals would have some effect on the atmosphere, not to mention the other substances that go into a spacecraft.